Rod Thomas continues to impress with his latest single under the Bright Light Bright Light moniker called 'How To Make A Heart'. I hope we don't have to wait too much longer for the release of the BLBL cd 'Make Me Believe In Hope'. If you are near New York City look out for some shows around March 10-14th before he heads to SXSW in Austin for more gigs (still hoping he pops up to Toronto for a show while he's over here). The U.K. pop duo Echoes are prepping for their first ever live gig in London on March 23rd opening for Matt And Kim, tickets and details here (also on the bill is the amazing Penguin Prison). Could this mean that Echoes are possibly going to sign to the Wall Of Sound label?? You can pre-order the forthcoming Tim and Jean cd "Like What" here, the release date is April 1st. Scritti Politti release 'Absolute (Best Of)' in the U.K. this week and is for sale at Amazon.ca for $10.99. Human League have released the first proper single from their forthcoming 'Credo' album (out March 21st, order here) titled 'Never Let Me Go' (apparently 'Night People' was just a teaser track??). The best remix I've heard so far is the 'Italo Connection Radio Mix'. Check out Kid Kasio's new single 'The Reason', great stuff. Liking the new album by The Tapeaters from Russia called 'Visions', they are opening up for Australia's 'Cut Copy' on their March dates in Russia. 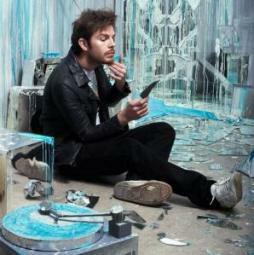 Enjoying the songs 'Houdini' and 'Helena Beat' from Foster The People's new EP 'Pumped Up Kicks'. Still listening to the Frankmusik song 'Stereo World' from his second free EP titled 'Long Live Frankmusik Vol. 2', EP is available for free download here.